midge writes. : when marketing DoEsN't lie. 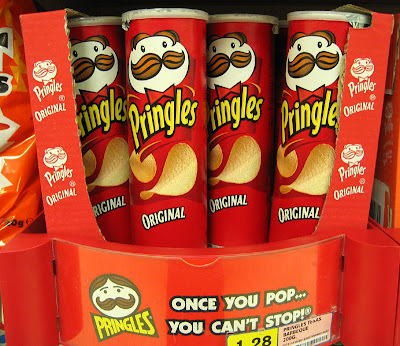 "once you pop you can't stop." have you ever heard anything more true? funny! we'd agree with you. if a bag of chips is open in our home, more than likely, it's gone. Welcome to Arizona - it will be fun to get together with you sometime. I can't say I think it is terrible because we are so far south in Tucson, but we were in Phoenix last weekend and I about died at how hot it was at night - good luck with that! And I also love pringes, but I don't like them because the canister shows you just how much you've actually eaten whereas the bag chips, it just a rough guess. And from what I understand, Rice A Roni really is the SanFrancisco treat.